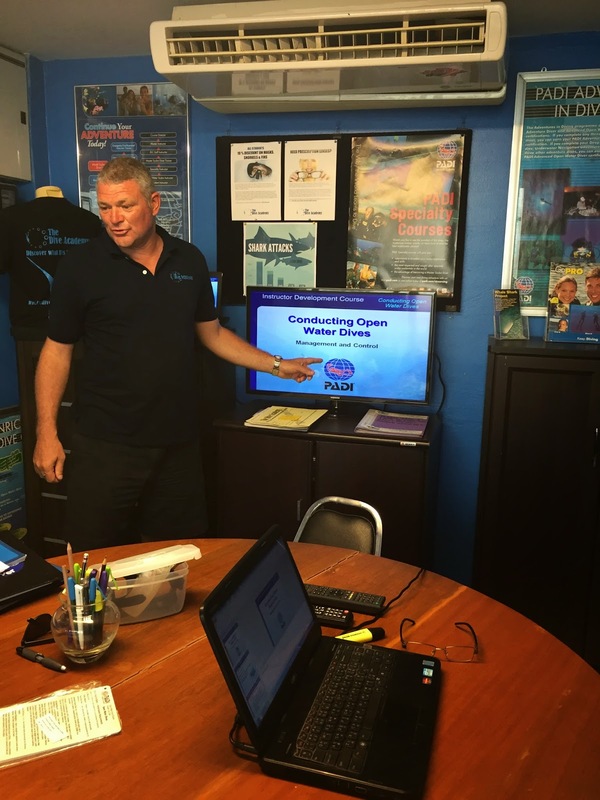 So the April IDC at The Dive Academy is now well underway and the first part is complete and Ariel is now an Assistant Instructor! After 2 days of Prep and 4 days of the AI course, Ariel has covered many topics and presentations including DSD and CESA workshops, the business and marketing of diving, risk management and theory and standards exams. Along the way she has been asking lots of great questions of Course Director Paul keeping him on his toes and ensuring she has lots of different explanations to help her become a great PADI Instructor. 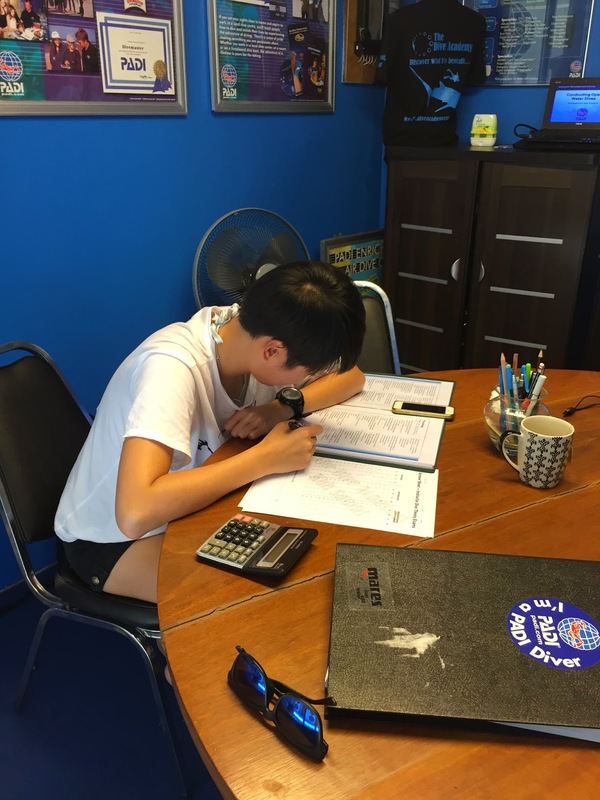 Ariel who speaks fluent Mandarin, Japanese and English has been working very hard every day to ensure she is getting good scores in all of her knowledge development, confined and open water presentations. To quote Ariel "that's what we Chinese do, study hard to pass the exam!!" The OWSI part of the IDC commences tomorrow and the IE is on the 21st and 22nd April. We look forward to welcoming Ariel to the club and to working with The Dive Academy through the summer high season. With her languages, she will be a great asset to any dive school as she continues her travels around the world. Ariel chose the The Dive Academy for her IDC because of our very small groups and therefore personal attention that you receive. If you're interested in having the ocean as your office, why not join one of the next IDC's at The Dive Academy starting in May or July on Samui and benefit from our special discount promotion. It's been another busy month down on Bophut beach and the peak season for diving around Koh Samui just keeps rolling! The weather on Samui is hot, hot, hot and we haven't had any rain now for several months now. The sea has flattened out and the viz has improved everywhere so we're getting great visibility at most dive sites now. Seems to be squid and puffer fish season right now too. We're getting a lot of sightings of squid around various Koh Tao dive sites, as well as Mappa Puffers, Porcupine Puffers and Seal faced Puffers. It's great to see a variety of marine life around us. Last month, saw us offering many private charters, including for Jeff Corwin and his Production & Film crews (see our blog page). A private boat trip is a great way to enjoy a day's diving and/or snorkelling with your friends and family, having Midnight Blue to yourselves and being able to choose your itinerary for the day. Why not give it a try? We reached over 300 great Trip Advisor reviews this month, which is a fantastic achievement and a credit to all of our team who each play a role in giving our customers the best experience possible. And thank you all for taking the time out to write the reviews and to help the spread the word about The Dive Academy. Ekin our current Divemaster trainee is making good progress through his course and is almost ready to be signed off. He just needs to work out which way up to wear his compass and he might just be able to navigate his way around! March also saw us say goodbye to Karl, one of our instructors who had been living on Samui for 10 years! Karl had decided that it was time to go back to the 'real' world and back to wearing pants & socks! Karl's sense of humour will be missed at The Dive Academy and we wish him all the best for the future. We have new team members joining us next month, so watch this space! April is going to see another IDC start at The Dive Academy, so more to come on that too!